Mission Community Archives is officially 30 years old on February 25th. Established in 1989 by the Mission District Historical Society, the Mission Community Archives houses a vivid, first-hand account of the Mission area's storied past. It is a treasure trove of information documenting over 125 years of the community's history, including its social, economic, and political development. The Archives is housed in a custom-built 3000 square foot facility - the first of its kind in the Fraser Valley - which was opened in 1994 - 25 years ago this year. Constructed by the District of Mission and leased by the Historical Society, the facility offers a spacious, secure, environmentally-controlled vault for records with a storage capacity in excess of 4,000 linear feet and optimal space to support the other operations of the archives, including records processing, reference services and public programming. This milestone year will be celebrated during Culture Days weekend at the end of September. A variety of programs and activities are planned and we like everyone to join us. Watch for more information on the website in the upcoming months and and also on our Facebook page page. Archival Assistants serve the public by working on projects to ensure the long-term preservation and accessibility of materials housed in the Community Archives. Tasks may involve creating indexes of records; unfolding, flattening, and re-foldering records; arranging and describing records in accordance with Canadian Standards; assisting with holdings maintenance work and other archival projects. Public Program Assistants help develop educational resources based on primary sources housed in the Community Archives for use in educational programs, exhibits, and social media platforms. Tasks include researching records, designing programs, and digitizing primary source materials for use in educational programs, exhibits and social media. Reference Services Assistants help members of the public seeking information housed in the Community Archives by processing in-person and written inquiries. Tasks include facililating access to relevant resources housed in the Archives, researching archival resources, and assisting staff with research calls and other general inquiries. For more information, please contact the Community Archivist, Val Billesberger, by calling 604 820-2621 (Thursdays or Friday afternoons only) or send her an email. Operated by the Mission District Historical Society, the Mission Community Archives serves as a central repository for all community records that document the social, economic, and political development of the District of Mission and the Fraser Valley Regional District Electoral Areas: I (Dewdney-Hatzic Island), J (Nicomen Island – Deroche), K (Lake Errock) and L (McConnell Creek-Hatzic Prairie). The holdings include the records of individuals and families, arts and community organizations, clubs and local businesses and some local government. The archives also maintain a small reference collection pertaining to the history of the municipality, genealogical research, and the administration of archives. The Community Archives also offers outreach programs designed to stimulate increased public awareness of the role and value of archives. At present, outreach activities include: guided tours of the archives to members of the public within and outside the community; exhibits to stimulate the knowledge, use and preservation of archival materials in the community; educational programs for primary, secondary and post-secondary students; information seminars and workshops on archives preservation and community history. 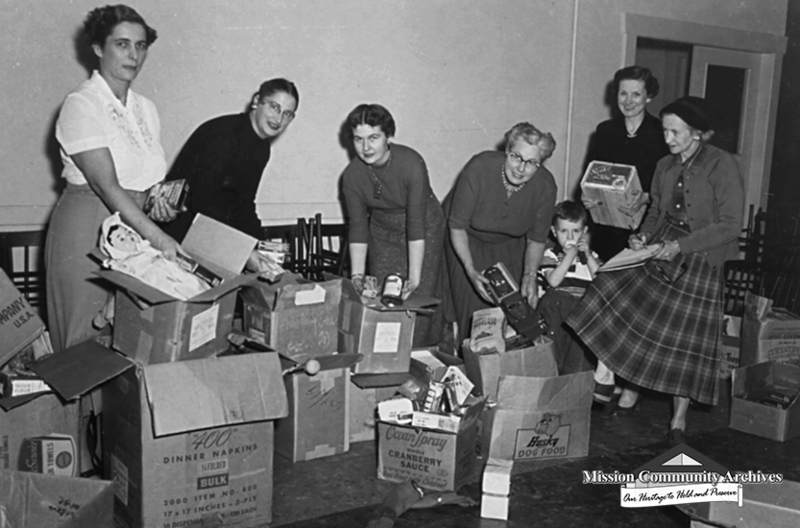 Count On Me Every Time) busy packing holiday hampers for needy families at the Municipal Hall on First Avenue in 1956. The club packed a total of "25 bulging hampers" and "21 cheer parcels" from donations collected by the Mission Junior-Senior High School Hi-Y Girls Club, Hatzic United Church Men's Club, and gifts from the tree at the CIBC, including cash used to buy items not donated. From left to right are: Mrs. Ken Ruttan, Mrs. R. Johnston, Mrs. F. McBean, Mrs. W.A. Stafford, Mrs. T. Kell with her son, Freddie, and Mrs. A.N. Lawrence. Visit our Facebook page for Blast From the Past on Tuesdays and Historical Trivialities on Sundays for photos and stories of Mission's storied past over the past 125 years! AND...be sure to follow us on Twitter for news and upcoming events.